Great News! For those of you who were unable to make one of our first sessions or are recently joining the Volunteer Leaders, we have added two additional Orientation Sessions! One this Saturday April 13th and one Easter Weekend Saturday April 20th. Both at 10am-11am and both on site. If you haven’t already, or to update your selection, please visit http://www.dontmesswiththedon.ca/volunteer-leaders/ and indicate which orientation session you plan on attending this. Also please make sure to check your Spam folders for the confirmation email and make sure to mark us a ‘not spam’ ;). Team Leaders (70): minimum commitment of 4 hrs. on April 27 and one 1-hr on-site briefing session before the day begins. Senior Coordinators (8): minimum commitment of 6hr. on April 27, and 4 hrs on one other day to co-ordinate responsibly. As a senior coordinator you have good leadership and organizational skills, and have a real commitment to the environment. If you are interested to join our Clean Up in any of the above capacities, please come out to this orientation session to get familiar with the clean up site, learn more about the positions and register yourself. These sessions will be on site of cleanup please see details below. The access road is beetween 71 and 73 Thorncliffe Park Drive. You may see a gate at the entrance to E.T. Seton park from Thorncliffe Park Drive as the City has not yet opened the park for parking. Just ignore the gate, and walk around it. For those coming by car: you can park your car at the East York town centre shopping mall which is walking distance. See you there! You can also get to the site by using the Lower Don Trail. North from Pottery Road or Beechwood. West from Taylor Creek or south from Sunnybrook and Serena Gundy parks. If you would like to become a volunteer lead on April 27th but cannot make any of these times, please send an email to ut us! We are offering Don’t Mess with the Don T-Shirts for sale. It woud be awesome if you could wear one on the day of the event to stand out from the general volunteers. To this end, we are selling them at $10 each which is UNDER cost price!! Please email us if your interested in placing an order and will have them ready for pickup the day of the event. Not required by any means, but the more visibility, the better. Thank you again for all your ethusiaum time and efforts put towards this clean up! 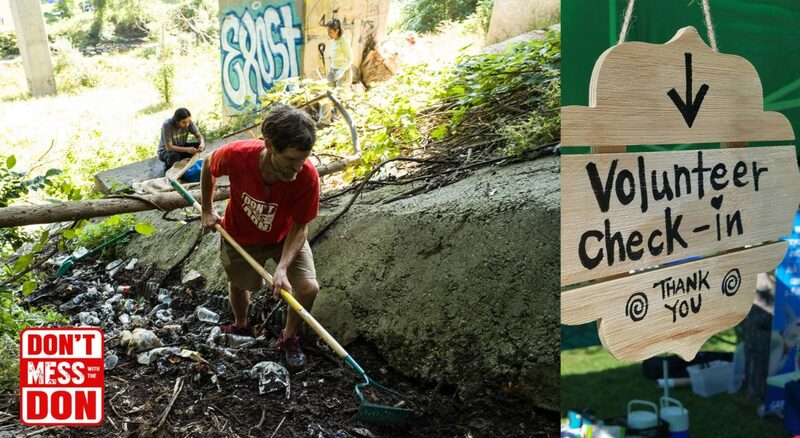 The Don Valley Ravine Clean Up & Revitalization is organized by Don’t Mess with the Don with the support of Evergreen, Greenpeace Canada, Salomon, Arc’teryx, Zero Waste Hub Toronto, One Piece a Day and UBX. do I mobilize 15 volunteers to work with me, or will there an assignment of volunteers on the day? I will certainly advertise this event and hopefully there will be a few neighbors and friends who will join in.